Cheese making is an art, with a good deal of science involved. Good artisanal cheese making is a real craft. It is the harmony between the cheese maker, the environment and their ingredients, that together produce a true craft cheese. If a cheese is made by strictly adhering to a scientific formula, with no human involvement in shaping the personality of that cheese, it may as well be made by a machine; as many processed cheeses are. This is a fundamental difference between an artisanal and factory produced cheese. Just a century ago, cheese was still a relatively regional and European phenomenon, and cheese making techniques were limited by climate, geography, and equipment. But modern technology along with the recent artisanal renaissance has opened up the diverse, time-honoured, and dynamic world of cheese to enthusiasts willing to take its humble fundamentals—milk, starters, coagulants, and salt—and transform them into complex edibles. Like many crafts, cheese can be fun to produce. Most people say they want to learn to make mozzarella or Cheddar, due to the fact that these are the two most popular cheeses eaten. There are however over 2 000 different cheeses that are made around the world, and with a little patience, many of these are easy to reproduce in small quantities at home. 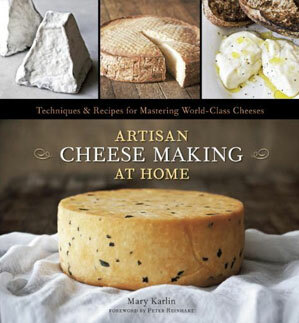 In her book Artisan Cheese Making at Home: Techniques & Recipes for Mastering World-Class Cheeses, Mary Karlin lays down the fundamental foundations for any hobbyist or would-be cheese artisan. After years of teaching cooking classes, cheese making classes, and making her own cheeses, she was inspired to write this comprehensive 240 page book about home-crafted cheese making. She begins by taking foundational steps and builds from there. She starts with easy, fresh cheeses; especially the ones made by direct-acidification. From there, fresh cultured cheese such as a basic chevre and some cultured dairy such as crème fraiche or fromage blanc. Making these will impart sound foundational information to any novice. Artisan Cheese Making at Home is a lavishly illustrated guide, which features more than eighty recipes for a diverse range of cheeses: from quick Mascarpone and Queso Blanco to cultured products like yoghurt, to flavourful selections like Saffron-Infused Manchego, Irish-Style Cheddar, and Bloomy Blue Log Chèvre. All the favourites are here, as well as some delicious speciality cheeses. The heart of the book is a master class in home cheese making: building basic skills and working up to developing and ageing complex mould-ripened cheeses. Also covered are techniques and equipment, including drying, pressing, and brineing, as well as moulds and ripening boxes. There is also a full chapter on cooking with cheese – see our recipe of the week for one of these delicious recipes. And for more recipes from the book, click here. 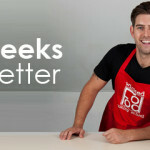 At Wickedfood Earth, we will shortly be running weekend cooking classes on basic cheese making. Artisan Cheese Making at Home is a book that we will definitely refer to on a regular basis for our cheese making classes. Interested in buying this book? Visit – Red Pepper Books – The South African online bookshop, is able to offer you great prices on any book you are looking for, and they deliver to your door. Pay only R326 for this book (Recommended Retail Price = R381) Red Pepper Books is offering Wickedfood Cooking School an EXTRA 10% off this book. Simply type in the promotional code WICKEDFOOD on the shipping page of the checkout process and your purchase will be reduced by a further 10%, a total saving of R56.